The planets orbiting TRAPPIST-1 may be older than Earth! This is a tough question to answer, but it’s actually important. It’ll tell us a lot about how stable planetary systems are, and how likely it is we’ll find more like our own solar system. TRAPPIST-1, as you may recall, is a very low-mass and very dim red dwarf star about 40 light-years from Earth — pretty close by, as stars go. In February 2017, astronomers made the stunning announcement that it had seven planets around it and, even more amazingly, all seven were roughly the same size as Earth! On top of all that, three of the planets —TRAPPIST-1e, f, and g — orbit in the star's habitable zone, at the right distance from the star to have liquid water on their surface. Well, theoretically. We can’t detect that directly, and it depends on a lot of factors. After all, Venus and Mars are technically in the Sun’s habitable zone, and look at them! Venus is hot enough to melt metal, and Mars is dry and cold and, as I’ve heard, ain’t no kind of place to raise your kids. All seven planets huddle pretty close to the star, too. The most distant, TRAPPIST-1h, is still just 9 million km from the star, far closer than Mercury is to the Sun. The star is so feeble, though, that the temperature on that planet is probably like Antarctica’s! Even so, its “year” is a mere 19 Earth days long. The planets are all so close together as they orbit the star that their gravity affects each other, too. As they pass one another their gravity speeds up or slows down the others, and this changes how quickly they orbit. These changes were actually detected in the observations. You might think that sort of tugging would disrupt the planets’ orbits, sending the system into chaos. But a complicated physical process called “resonance” — where the orbital periods of the planets are simple whole number ratios of each other, like 24/15 and 24/9 — actually works to keep them stable, perhaps over long periods of time. One study indicated the planetary configuration can last for over 50 million years. But how long can it stay that way? It’s not clear, and that’s why knowing the age of the star (and therefore, presumably, the planets) is important. There are various methods to determine the ages of low-mass stars like TRAPPIST-1, but they can be really hard to implement and tend to yield huge ranges for the age. Sometimes you can only get a lower limit; for example, low-mass stars tend to use up all their lithium supply in about 200 million years or so; after that, it’s all fused into helium. So if you don’t see lithium in a low mass star, it’s probably older than 200 million years. There have been several papers published on the age of the system, but each one tends give a different age, and a wide range of possibilities. So a pair of astronomers (Eric Mamajek and my old pal, Adam Burgasser) decided to work it out. They used a series of age indicators to get the likeliest age of the star, including how fast it rotates (older stars tend to spin more slowly), how much heavy element abundance there is in it, and even its velocity through the Milky Way (that method is complicated, but the way the star moves as it orbits the galaxy is tied to how old it is). When all was said and done, they found the best estimate for the star’s age is 7.6 ±2.2 billion years — older than the Sun! Our star and planets are about 4.55 billion years old, give or take, so if this research pans out TRAPPIST-1 was already billions of years old when the Earth was born. ... and that’s pretty interesting. We don’t really know if our own solar system is stable in the long term. It’s been around a long time, sure, but things change. Our models now indicate that the outer planets moved around a lot, toward and away from the Sun over time, messing around with the dynamics of the solar system in the process. I’d guess that we’re good for quite a long time yet, but this result about the age of the TRAPPIST system implies that multiple planetary bodies can exist for a substantially decent period. I’ll add that the resonance I mentioned above not only helps, but may be critical. As planets move around, that resonance helps shepherd them into “safe” orbits, ones that keep them from destabilizing the entire system and throwing it into chaos. Our solar system doesn’t have that (though there are some resonances among the moons and other small bodies, the major planets are not in one; the gravitational interactions between them are currently very small, though). How important is this for long-term stability in a solar system? Knowing the age of TRAPPIST-1 is a step toward understanding that. TRAPPIST-1 was discovered only in 1999, and the first three planets found in 2015, with four more just two years later. We’ve really only just begun exploring it. Do the planets have moons? Are there more planets orbiting the star? What are the planets made of, and do they have atmospheres? 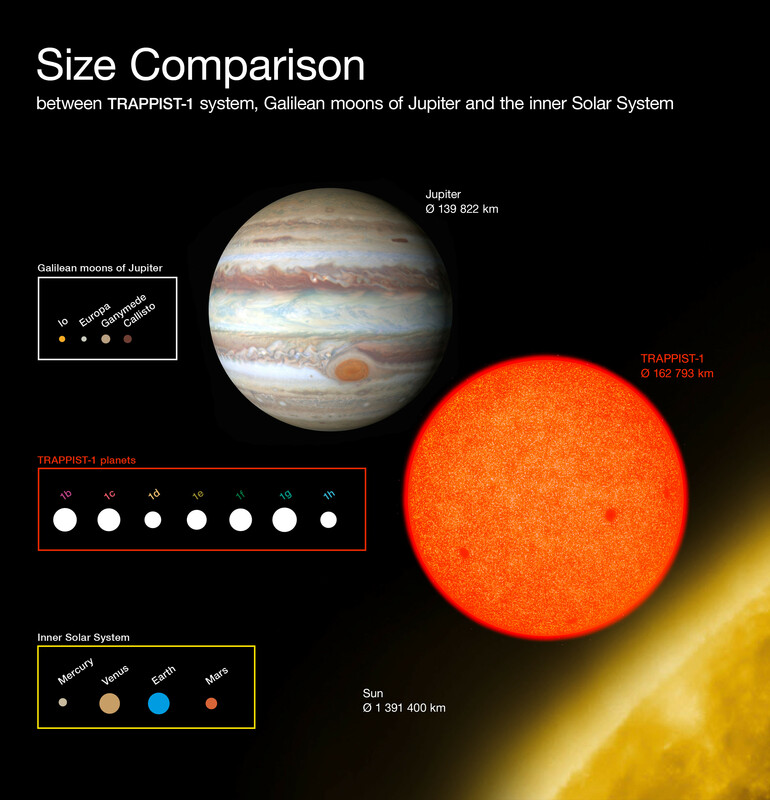 We still aren’t completely sure how big the planets are; this new research to find the age also revealed the star may be slightly bigger than previously assumed — 0.121 times the Sun’s diameter, or about 168,000 km ... not much bigger than Jupiter. That, in turn, means the planets are probably somewhat bigger (by about 3%) but also less dense, by 11%. That means some are lower-density than Earth. Could that be because they have thick atmospheres, or oceans? These would help them survive the blasts of radiation TRAPPIST-1 sometimes puts out ... and while I wouldn’t speculate overmuch about the actual habitability of these planets, that’s something we may understand a lot more about over time as we study this weird little system. And we’ll have plenty of time. Low-mass stars are very conservative with their nuclear fuel, and TRAPPIST-1 may still be shining much as it is today for the next couple of trillion years. Yes, trillion. It existed before we did, and will shine on long after our Sun is a dead white dwarf and our planets either consumed by the long-deceased star or frozen due to its cessation of energy production. Still, it would be nice to know more about it before then! I suspect that the James Webb Space Telescope will be used to take a look; it may even be able to detect the atmospheres of any of these planets, should they exist. Patience is a virtue astronomers must have sometimes. It’s a big Universe, and learning about everything in it will take some time. P.S. In the research paper acknowledgment section comes this gem: “The authors … thank the Hon. John Culberson of Texas’s 7th congressional district, US House of Representatives, for asking about the age of TRAPPIST-1 during his visit to JPL in February 2017, which spurred the writing of this paper.” Heh. How often has that happened?